The Makgadikgadi Pans are the world's largest salt pans and despite the categorization the pans and the surroundings support an array of wildlife, much of which is not encountered in the game-rich northern parks. The pans are dry for much of the year but during good rains a considerable amount of water may collect, attracting a profusion of water-birds including flamingoes. 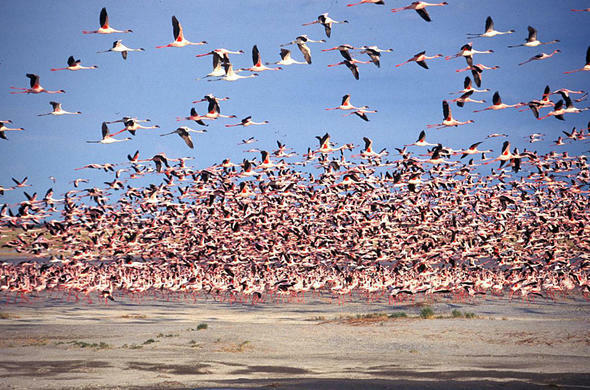 The flamingoes breed on the pans when the water is high enough to protect their nests from predators. 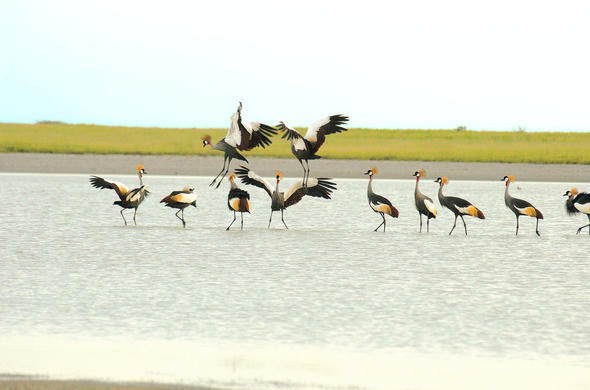 The award-winning documentary 'Year of the Flamebird' was filmed on the Makagadikgadi Pans. The story documents the flamingos that colour the pans during seasons of good rains and dramatic footage shows the breeding of the flamingos on the pans. Despite a great deal of research little is known of the movement of flamingos on the African continent, but what is certain is that the Makgadikgadi Pans are one of the strongholds of these magnificent birds. Like these Cranes gathering near Nata Lodge on the Makgadikgadi, bird species numbers increase dramatically during the summer months when the migrants arrive to take advantage of the bounty brought on by the rains. Waders, birds of prey and a collection of sorts add colour and sound to the area. 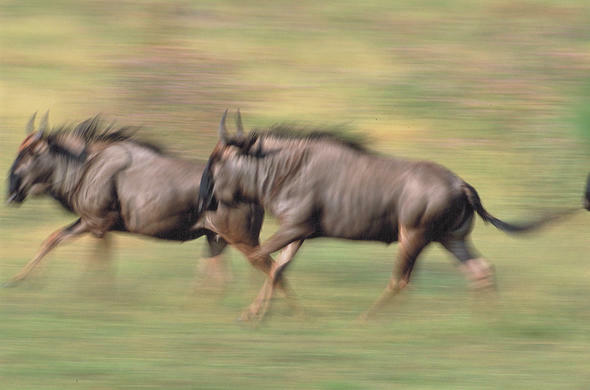 The Makgadikgadi region has its share of big game in the form of predators such as lions and the larger herbivores such as zebra and wildebeest but it is the lesser known creatures that attract many visitors. 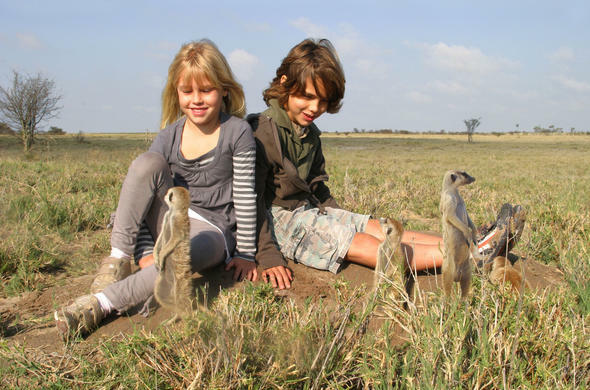 The meerkat is the favourite of all the people who come into contact with them and in parts of the Makgadikgadi there are wild groups that have become accustomed to humans, like these Meerkats at Jacks camp. 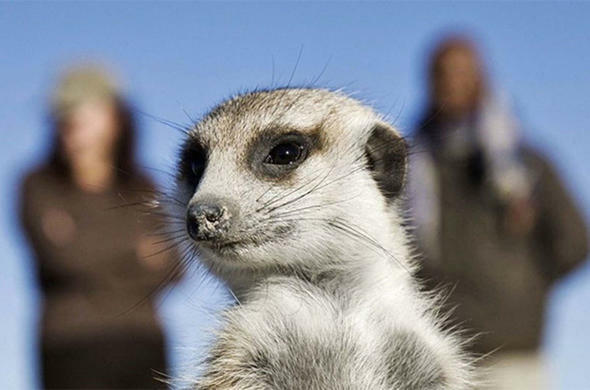 Sometimes, a Meerkat will even use a persons head as a vantage points. Other interesting animals that are rare in the northern parks are the brown hyena and the aardwolf. Generally nocturnal not much was known of the two species until extensive studies began in the Makgadikgadi. There is a relatively large land migration in the area after the rains when thousands of zebra and wildebeest migrate to the new grass surrounding the pans. However, as in much of Africa water is precious and this migration is being threatened by a disagreement between farmers and conservationists. The disagreement began when the Boteti River, once the lifeblood of the region began to dry up. The Boteti is an overflow of the Okavango Delta and the water provided more than sufficient for wildlife and domestic stock alike. The river was the natural boundary between the wilderness areas and the farming areas but with the drying up of the river water was at a premium. Boreholes were sunk to access water for the animals but the provided water became the source of much debate as tens of thousands of animals were sharing a fraction of the water that was available in the past. A temporary solution has been found with the erection of a veterinary fence that separates the two factions and divides the waterholes between the park and the domestic lands. Despite the fractious situation regarding the water the wildlife of the Makgadikgadi is stable and a visit to the region will provide a unique African safari experience.